DESCRIPTION ESTATE HOME DESIGN AND QUALITY! WALK-OUT BUNGALOW. 2,779 sq’ developed living space. $300,000+ in upgrades! Exceptionally large pie-shaped lot! enter the spacious foyer, and you’ll be taken by the vaults, arched entries and amazing natural light! Amish Hand-scraped Maple hardwood + Cork Flooring. Bright Den/Office off foyer. Formal Dining Room w/hutch alcove framed by windows, wainscoting and custom column entry. Great Room cathedral ceiling soars to 16 ft! Beautiful Gas Fireplace w/ hearth + mantle. Wall-of-windows offers views to exceptionally landscaped back yard. 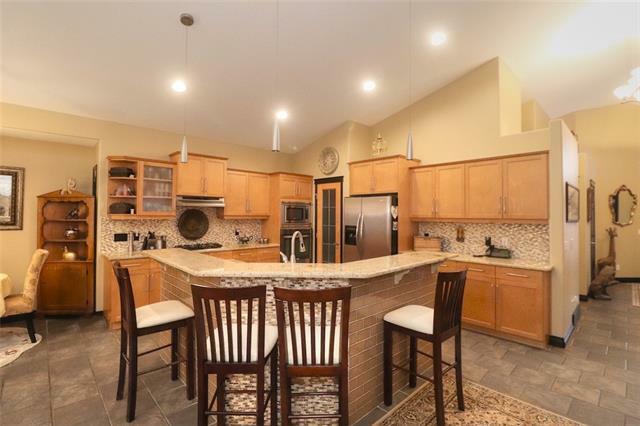 Granite Kitchen hosts central island w/ Breakfast Bar. Island features double Premium Chef’s faucet w/3-stage water filtration system. Chefs will love the SS Gas Stove + Hood Fan. Beautiful Maple cabinetry w/roll-out drawers throughout. Under cabinet lighting. Walk through Pantry! Wrap-around deck w/gas BBQ hook-up off nook. King-sized Master Retreat! You’ll love the arched entry and chandelier! 4-pce Ensuite features jetted tub + skylight. Generous walk-in closet. Main Floor Laundry w/ LG Steam Washer/Dryer. Gorgeous custom curved staircase leads to walk-out level. Builder finished. Wall of windows bring in lots of light. Extra-wide hallway w/ wainscoting. Engineered hardwood flooring w/ in-floor heating. Expansive Family/Rec room. Flex Room w/Rough-In for 2nd Kitchen/Wet Bar. 2 spacious bedrooms down. Lovely 4-piece bath. Tons of storage in Utility room. Central A/C. Vacuflo. Finished Garage interior. Garden doors lead to expansive covered concrete Patio. Huge, fenced back yard w/stunning terraced gardens. Mature trees + variety of berry bushes. Organic culinary herb garden. Charming Garden shed + Cedar tool shed. This lot is a gardener’s dream! So close to schools, playground, shopping + Fish Creek Park! You do not want to miss this exceptional home and property! Call today for a private showing. You’ll be so glad you did! Home for sale at 96 Everhollow CR Sw Calgary, Alberts T2Y 0A9. Description: The home at 96 Everhollow CR Sw Calgary, Alberta T2Y 0A9 with the MLS® Number C4238582 is currently listed at $649,900.